Kidney+SP was formulated from 3 herbs: Polyporus umbellalus, Orthosiphon aristatus, and Rehmania glutinosa in a specific ratio and concentration that have shown very positive effects for balancing the body, especially for people suffering from chronic glomerulonephritis, or IgA nephropathy with high blood creatinine and/or high proteinuria (high protein spillage in urine). Suggested Usage: As a dietary supplement, take 4 capsules each time, three times a day, or as suggested by a healthcare provider. 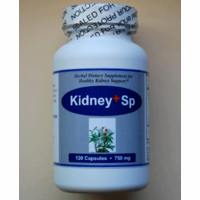 Kidney+SP was designed by medical doctors and master herbalists from high quality concentrated unique herbal extracts, such as rare herbs Polyporus umbellalus, Orthosiphon aristatus which are traditionally known for their positive effect for healthy kidney and urinary function*.This product is considered a natural dietary supplement. Note: Kidney+SP effectiveness may be enhanced by taking Kidney -Tonic and/or SuperK-antioxidant for complete kidney support.